A little ad here and there – No problem! 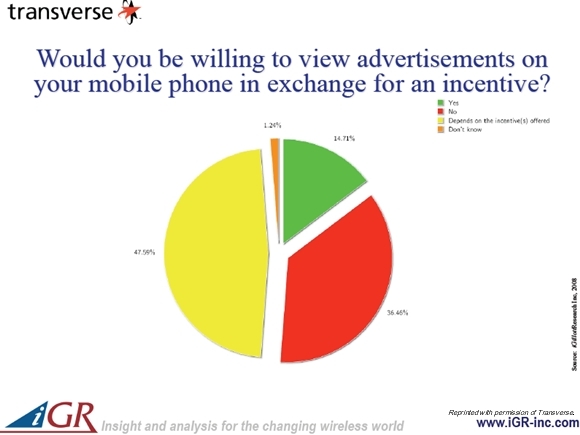 Nearly two-thirds (61%) of mobile users say they would be willing to view advertising on their mobile phone in return for a discount on their monthly bill, according to a survey commissioned by Transverse and conducted by iGR. I know I’d do it in a heart beat. Would YOU? Regardless of incentive, the majority of respondents who would accept one (71%) say they would view up to five ads per day. Mobile users under age 35 were most receptive to advertisements on their mobile device in exchange for discounts on their monthly service bill. 46% of those surveyed said that a 25-50% discount on their monthly bill would be enough of an incentive to provide access to their usage patterns – including browsing, email and texting habits and location – but not personal information such as the content of texts and emails. Younger users age 8-25, who are more apt to text, are among the most willing to let mobile companies track and release the number of text messages they send/receive in exchange for ad viewing. Those age 26-44, who are more apt to talk, are most willing to allow mobile operators to document and disperse details about their voice usage in exchange for discounted services. Let’s face it, when we can save money we’ll put up just about anything. Make it free… that might get really interesting! Previous postHang on it’s coming! there was a free cell phone service in france where people get to listen to 30sec of advertising before being able to do a 1min call. If it’s a 2 min call, then 1 min of advertising. etc. The service wasn’t that successful after a while. Because cell phones are communication devices, not entertainement devices. Advertising don’t work on communication devices.